Ralph & Duane's was first started by Ralph in 1933 and was then a bar and grill. Duane, the current landlord of the building, is Ralph's stepson. Local business people would stop by for lunch, cocktails and business meetings in those early days. 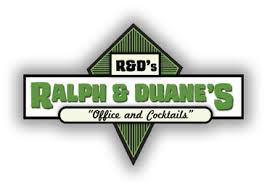 Ralph & Duane's still honors this tradition with ''office and cocktails'' clearly visible in their current logo. Mike Maretti bought the business in October 2001 after having run Maretti's Saloon in Santa Maria for 9 years. Just months later, Mike unfortunately passed away. He was loved by everyone and to this day all of the regulars remember and often reminisce on what a great guy he was. After his passing, Mike's wife, Marsha and her son, Arly, had to step up and learn the bar business and they still proudly own and operate the business today. Marsha & Arly Maretti love having their business in the historic Arroyo Grande Village. They note that many of their customers are long time regulars who have now become their life-long friends. They invite you to ''duck in and have one'' with them and become a part of the rich Ralph & Duane's history.